Suzanne Collins' novel The Hunger Games is immensely popular and is arguably the most successful within a wave of young adult science fiction novels set in dystopian societies in which often-faceless authorities (adults) put groups of young people into elaborately constructed, unnecessarily dangerous, and clearly artificial situations, experiments, or tests. Relationships among the youths are explored within the confines of these tests, and passing the test means survival. One could say the settings of these stories resemble high schools designed by social Darwinists. Other notable examples in this subgenre, which I will name Social Psych Tests (unless someone else has named it something better already) include Divergent, The Testing, and The Maze Runner. 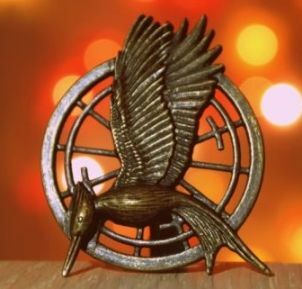 Other people have pointed out that The Hunger Games seems inspired by a variety of sources, including the gladiator games of ancient Rome, novels such as Battle Royale and Lord of the Flies, and reality TV shows (especially Survivor). Some, who don't understand concepts like copyright and public domain have criticized Collins's story for not being 100% original. Well, few stories are. One might as well criticize Star Trek: Voyager for ripping off Homer's Odyssey, or say that every story with a love triangle plagiarizes The Iliad. Even when stories aren't in the public domain, you can't copyright ideas, only the expression of ideas, and Collin's exploration and expression of ideas like child soldiering, tyranny, inequality, violence as entertainment, the collapse of civilization, and the contrast between image and reality in media is very much her own. Personally, I think Collins should be praised for giving young women (and men) a great hero, in the form of Katniss Everdeen, and a great vehicle the current generation can use to consider these issues. This time, I'll start with the simplest way to look at the overall story: the W-Plot. 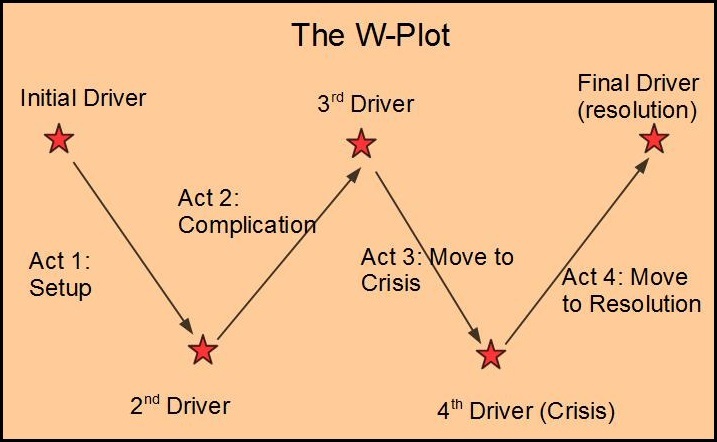 To review, the W-Plot is a four-act model of story structure. Each act begins and ends with a major turning point or Driver (represented as a star on the diagram). Each line represents an act or a journey between two drivers. As you can see, each act concerns a different phase in the arc of the overall story and is a result of the preceding driver. Dramatica theory states that the drivers are generally either all decisions or all actions. Certainly the majority of the drivers in The Hunger Games are decisions. 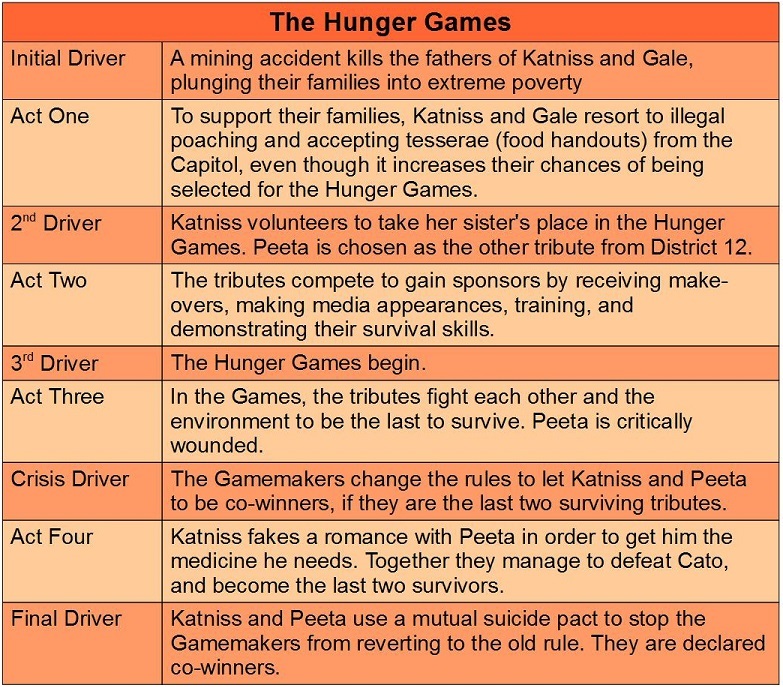 The Final Driver can be seen either as Katniss and Peeta's decision to commit suicide or the Gamemaker's decision to allow them to be co-winners, but it's a decision either way. The moment when Katniss volunteers to take Prim's place in the Games is also a decision, as is the Gamemakers' decision to change the rules (4th Driver). The start of the Games (3rd Driver) could be either decision or action, depending how you look at it. The one exception is the mining accident, which feels more like an action. Yet I still see this as the Initial Driver because it creates the threat (death by hunger) which drives the rest of the story. Dramatica considers acts and drivers to be progressive plot elements because they must occur in a particular chronological order. Also important, however, are the 8 Essential Plot Elements. These are called static plot elements because it doesn't matter where they occur in the story or what order they appear in as long as they appear somewhere. Also, they can be illustrated multiple times or in multiple ways. Obviously Katniss, the Protagonist, is concerned with winning/surviving the Games and also with the survival of her family who depend on her. But not only is she and every other tribute fighting to survive in the arena, survival seems to be a concern of most other characters in the novel. However, survival in The Hunger Games doesn't just mean staying alive. Equally important is the issue of whether one's humanity, one's essence, can survive the effects of the Capitol's tyranny and the competition for the precarious supply of resources. Obviously, death is a constant threat for people in District 12 and an almost certain consequence for most tributes. However, besides death, the Capitol frequently uses its power to force other horrific changes upon unsuccessful tributes. For instance, many of the tributes who die in the arena are reborn as mutated monster wolves in the Finale. There is an implied threat that the games will force Katniss to become a monster who kills, not just in self-defense, but to achieve victory at the cost of other lives. The key to surviving the hunger games is for tributes to win the support of sponsors who can send them life-saving items in the arena. To get sponsors, a tribute must make themselves known to them through media appearances, getting a high score from the Gamemakers, etc. For Katniss, this also requires being seen as Peeta's star-crossed lover. Many damaged characters appear in the story as warnings to Katniss and the readers that the odds of surviving undamaged are not in anyone's favour. In addition to the mutant wolves, we see an Avox girl, whose tongue was removed because she rebelled. Hamish, who won the Games, suffers from post-traumatic stress that he manages through alcoholism. Mrs. Everdeen's depression following her husband's death in the mining accident is also the indirect result of the Capitol's demand for resources. When Katniss shoots an arrow at the Gamemakers she helps them realize how daring she can be, which gets her a high score that in turn attracts sponsors. Peeta's confession of love on TV makes Katniss seem desirable (also drawing sponsors). Katniss is able to score a big victory when she realizes that the career tributes' greatest weakness is their dependence on a hoard of supplies, which she can destroy. After the games, Katniss must sell the Capitol on the notion that the suicide pact was an innocent act of love rather than defiance of the Capitol. The rule of the Games is that there can be only one winner, and the Capitol changes this rule reluctantly. Just as important is the unspoken rule that no one is allowed to contemplate any defiance or criticism of the Capitol. The threat of the Games makes Katniss decide that she never wants children. The responsibility of providing for their families means Katniss and Gale cannot live the way they want. Even after they win, Katniss and Peeta have little control over their future. I might also include as costs Peeta's loss of a leg and Katniss's various injuries. Peeta's gift of bread when Katniss is starving buys her family a future. Katniss later receives a loaf of bread from District 11 in return for the respect she shows to the body of Rue, a District 11 girl with whom she shares a brief alliance. Even though she considers her relationship with Peeta to be mostly phony, Katniss comes to value it. I confess it took me some time to decide whether Katniss is a change or steadfast character (that is, does she change her approach at the crisis in favour of a new one, or does she stick to her original approach). Peeta is the Impact Character in The Hunger Games, the one who offers the main character an example of a completely different approach. While Katniss hides sentiment, Peeta wears his heart on his sleeve, confessing his love for Katniss on national television. Moreover, while Katniss is concerned with physical survival and is willing to do whatever that requires, Peeta is more concerned with retaining his essential identity. He tells her, "I don't want them to change me in there. Turn me into some kind of monster that I'm not." When Katniss faces her personal crisis, following Rue's death, it is Peeta's words that she recalls and that influence her to express sentiment in a way that will show the Capitol that Rue is not just a pawn in their Games. She decorates Rue's body with flowers and says a respectful good-bye, even though that is breaking the rules. 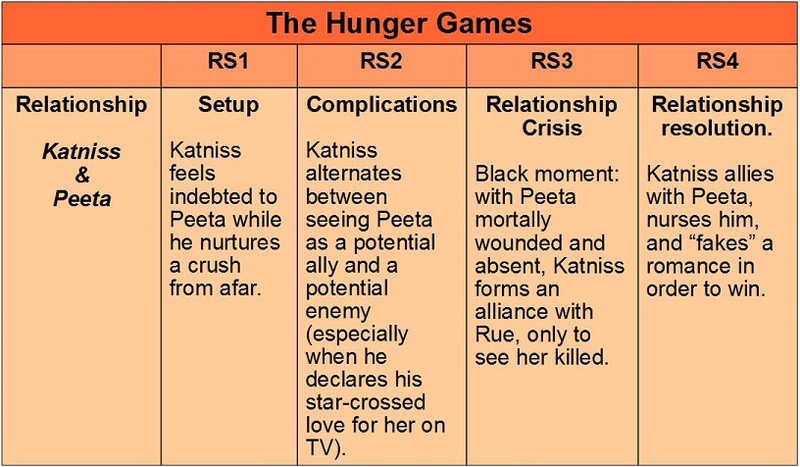 Peeta's throughline shows how he is willing to suffer at each stage of the story in order to remain true to himself and his feelings for Katniss. He survives, but unfortunately does not get the girl (yet). This is the element that forces a story to its climax. In The Hunger Games the climax arises because there are only 24 tributes who are eliminated one at a time. The reader appreciates that eventually, Katniss will be forced to deal with Cato, the hardest tribute to defeat, and that this confrontation will be decisive. This type of limit is called an "optionlock," because the climax occurs when the characters run out of options. By the end of The Hunger Games, the goal is achieved, in that Katniss and Peeta survive and Katniss can ensure her family's survival with her prize money. However, Katniss seems to end up in a worse place (a Judgment of Bad). Having earned the anger of the Capitol, her life will be less free than ever. Her backsliding return to suppressing sentiment is a less than happy resolution to her inner conflict. Hence, I would call this story a Comi-tragedy. The Monomyth is another model of story used very often in Young Adult fiction. It is far less flexible than Dramatica, in that it prescribes a fixed set of steps that should unfold in a predetermined order. The story opens with Katniss's present life, poaching game with Gale. Katniss is summoned to the Reaping where she volunteers to become a tribute. Katniss enters the wider world in the Opening Ceremony. Katniss undergoes training, makes TV appearances, demonstrates her skills, and navigates the politics behind the games. Katniss enters the arena and the Games begin. She struggles against the other tributes and the environment and hazards created by the Gamemasters. In the Finale, Katniss & Peeta escape the wolves, defeat Cato, and threaten their suicide pact. Katniss and Peeta are declared winners. Katniss is able to leave the arena with Peeta still alive. Katniss travels by train back to District 12. Katniss can settle into the Victors' Village with her mother and sister and enough money to live comfortably. It's important that there are different models you can use to analyze story structure. 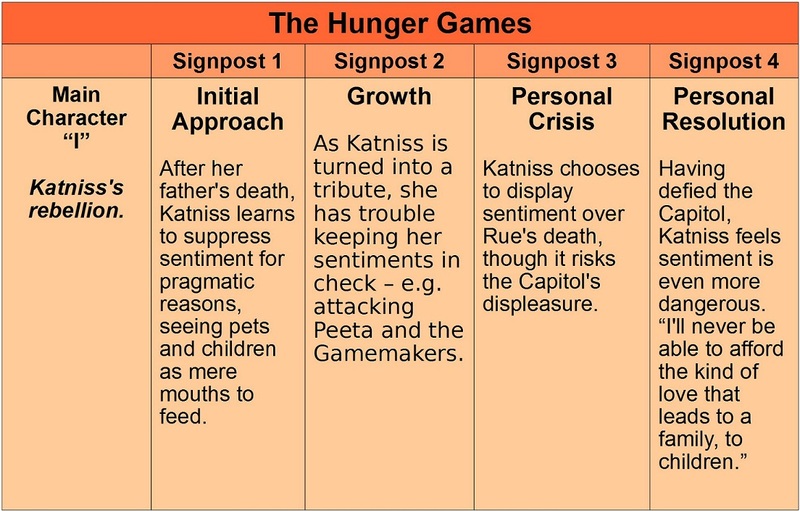 The Hunger Games is a good example of how the W-Plot, Dramatica, and the Monomyth can all offer insights into the same story. As a writer working to create a solid story structure, you are free to choose a model that works with the story you want to tell. You want a model that triggers new ideas and offers you enough insight to give you the feeling of empowerment, but not so much complexity that you find yourself paralyzed or worried about "getting everything right."